Courtesy photo Bishop Guertin alum Jon Pastor takes shots at a punching bag during a workout for his bout two months away as part of the Haymakers For Hope charity event. Mike O’Malley was out in his neighborhood jogging on New Year’s Day, a sight that his neighbors weren’t quite used to. Well, guess what – between now and May 15, the 2003 Nashua High School alum really is. 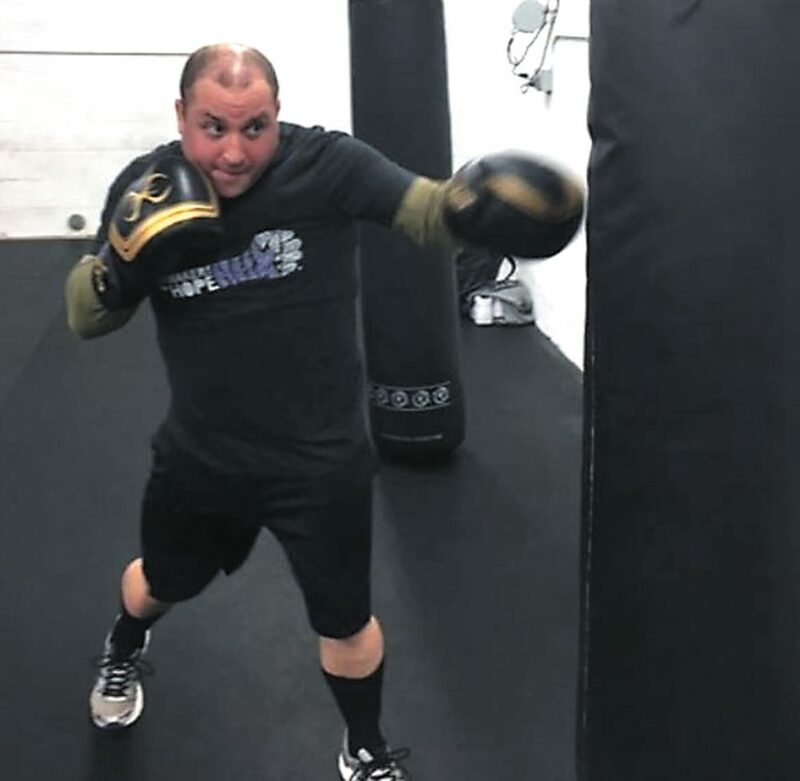 O’Malley and another friend, Bishop Guertin alum Jon Pastor, are going to be boxing in the charity event for Haymakers For Hope at the House of Blues in Boston on May 15 at 7:30 p.m. It won’t be against each other, as they are in different weight classes, but it will be part of a series of three-round bouts as the organization raises money for cancer research. Milford’s Cameron Conley, the four-year-old son of friends, Joe and Val Conley, is suffering from a rare form of cancer, acute lymphoblastic leukemia, and the two are fighting in his honor. So how do two guys get into the boxing world, for however brief a time it may be? The pair, who went to school together at Elm Street, didn’t know the other was doing it until they saw each other at a Haymakers orientation. In fact, they hadn’t seen each other for 15 years. Pastor, who handles major accounts for a health company in Newton, Mass., was more familiar with the organization, having already rooted on another fellow Guertin grad, Mark Avery, who fought a few years ago (Avery is actually director of the program now). And he has donated to the Jimmy Fund and worked at Dana Farber before. According to Pastor, there were 250 applicants. Part of the application is your athletic history, work background, and how much you feel you will be able to raise. The goal for the event in total is $750,000, and each signed up for $30,000 and are hoping to bring in at least $25,000. O’Malley and Pastor each got an emails just after Christmas saying they were selected. That’s the easier part. The hard part? 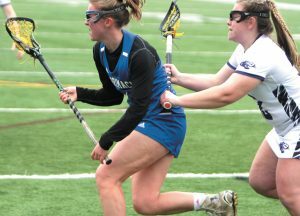 O’Malley, who played baseball and golf at Nashua, enjoyed the holidays, and then changed up his diet and began training at least six days a week. Two of them are double sessions. O’Malley works out at a gym in the Weymouth, Mass., Area, and is trained by Chris Traietti and Ryan Kielczweski, both professional fighters for TKO BoxFit. The sessions also include mental preparation and strategy. Haymakers provides a list of trainers, or you can get your own, but they monitor everything very carefully to ensure the participants are getting the proper guidance, etc. to avoid injury. Nearly three weeks ago, O’Malley fought someone for the first time. How about taking a punch? Pastor, who lives in nearby Chelmsford, did the same thing. His diet was for real, and he started working out halfway into January. Pastor was trying at one point to get famed Lowell boxer Micky Ward to possibly train him through some indirect contacts, but it didn’t work out. So he went through Haymakers, which had partner gyms and is using Nolan Brothers Boxing in Waltham, Mass., namely Mark and Matt Nolan. He started sparring about a month ago, and it was light at first. “I took a couple of licks but it was more of an educational thing,” he said. O’Malley was impressed with the way Haymakers monitors things. “They take every aspect of this, they evaluate the gyms, evaluate the coaches, in order to make sure of the progress you’re receiving,” he said. Pastor is dropping 40 pounds to fight in the 165-pound class and has about 23 more to go. “It’ll bring me back to my high school wrestling days,” said Pastor, who wrestled and played football at BG. O’Malley, who will box at 160, was a member of the final graduating class for the one Nashua High. The two can’t imagine what boxers they’ll turn into by two months as they are eight weeks in. They found out a week or so ago who they’re May 15 opponents are and sparred with them at a Haymakers session in Waltham last Sunday.